Welcome to the tour of Hong Kong!! Arrive Hong Kong, proceed to immigration formatlities, collect luggage from conveyor and continue to greeting hall area. Meet Local representative and proceed to hotel (HOTEL STANDARD CHECK-IN TIME IS 14:00).Later you will be picked from hotel and proceed for afternoon Hong Kong City Tour covering Victoria Peak, Repulse Bay, Aberdeen Fishing Village, Jewellery factory, drop at shopping area. Dinner & Overnight at your hotel. Enjoy breakfast at the hotel. 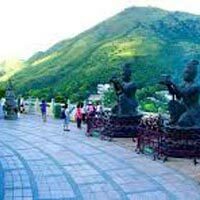 After breakfast, proceed for Macau city tour which covers Visit:Ruin's of St Paul, The Old City Wall, Fisherman's Wharf, A-Ma Temple, Macau Tower exclude entrance fee, Casino, Macau Cake Shop and Souvenir Shop. Dinner & Overnight at your hotel. Enjoy breakfast at the hotel. After breakfast, check out, we take hotel free shuttle bus to ferry pier by own arrangement Take ferry from Macau to Shenzhen. After arrival in Shenzhen, meet at Shenzhen border and transfer to hotel.Dinner & Overnight at your hotel.